What's Next for Kentucky in the Global Economy? How environment, finances, and education influence health outcomes. (19 April 2019 - UKNOW) What impact does University of Kentucky research have on the Commonwealth? 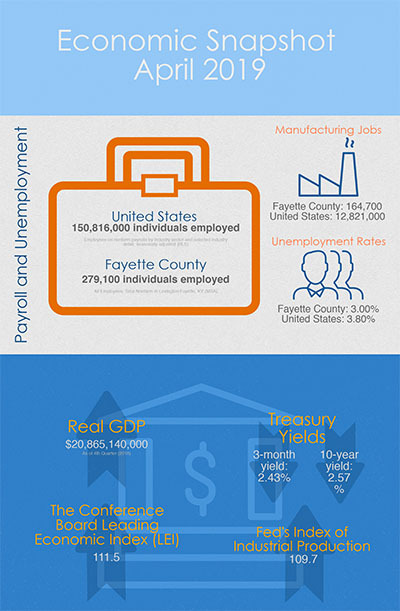 (18 April 2019 - WTVQ) Kentucky’s seasonally adjusted preliminary March 2019 unemployment rate was 4 percent, according to the Kentucky Center for Statistics, an agency within the Kentucky Education and Workforce Development Cabinet. (18 April 2019 - The Lane Report) Kentucky’s seasonally adjusted preliminary March 2019 unemployment rate was 4 percent, according to the Kentucky Center for Statistics (KYSTATS), an agency within the Kentucky Education and Workforce Development Cabinet.